Typical of Nordic, and in particular Finnish Jugend / Art Nouveau works, the chairs boldly play on geometric forms and natural motifs. 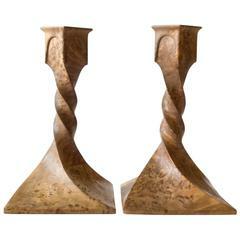 Each chair beautifully hand-carved. 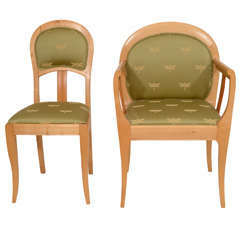 The chairs are sturdy, comfortable, professionally restored, reupholstered and ready to add to you collection. 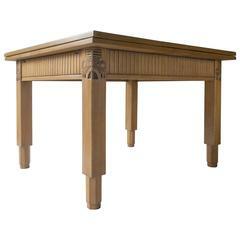 The linear top-rail, surmounting a tall and remarkably thin backrest adorned in stylized fern motifs, the shaped seat above a fluted frieze, raised on saber back legs and square front legs terminating in octagonal feet. 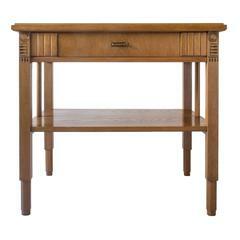 Beautifully restored, reupholstered and ready to add to your collection. 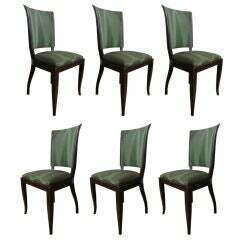 Original set of six high back Art Deco chairs. 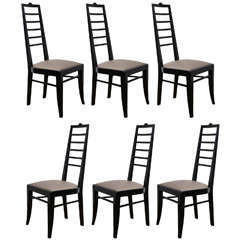 A set of six elegant black lacquered high back chairs. The seats are re upholstered in grey leather. Italy, circa 1940. Set of six oak chairs.